Hello, friends! 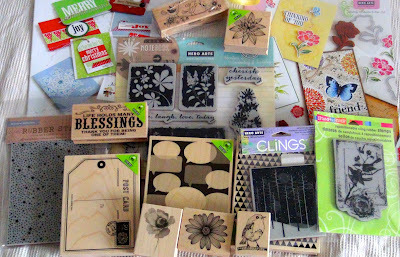 My craft goodies have arrived and I can not wait to try them all. I have quite a collection of Hero Arts stamps now. My neighbor's mother was traveling to the US for a family visit. She was so kind to bring lots of craft items. I am afraid I even abused her kindness, as I forgot how heavy some papers stacks can be. This cute bird was stamped with black Staz on and colored with distress inks. I used perfect pearls mixed with water to add some shine to the bird and the panel image. I like how the yellow meets blue and gives birth to a new color. A close-up of the cut out and popped up bird. For this card I inked the Tiny Flags background stamp with bright distress inks and spritzed with water. The sentiment was white embossed on light blue vellum. This card goes to my husband who is my true blessing! How wonderful for you! Beautiful stamp choice and I hope you will have many hours of creative pleasure! Your cards are beautiful!